Nina Segal‘s Big Guns examines the phenomenon of YouTube, vlogging and blogging. A subversive culture starting life just over a decade now, the medium has taken on a life all of its own. For centuries, print media and TV have been the cultural makers and breakers, however social media has completely changed the game. A generation no longer looks to the trendsetters of yesterday, they now look to those who have started from modest beginnings (Zoella/PewDiePie/Pointless Blog/Marcus Butler) who are like us, live among us, have the same issues as us, have a message to deliver; and have amassed millions by showcasing their lifestyles as a new genre of TV programme. Their narratives are shaping the minds of this generation and Big Guns taps into the zeitgeist of this culture. Debra Baker and Jessye Romeo take on enigmatic roles, they take on the thousands of successful as well as those starting out vloggers and bloggers and play out their dialogues. Segal’s script sways between interviewing, echoing and critiquing. 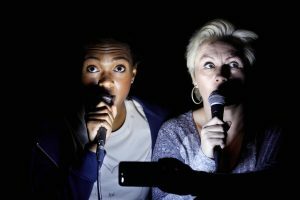 This play on language is fun and cleverly offers a social commentary in terms of the multiple ways we all interact with one another on social media. The text questions agenda, it questions the intentions of those willing to display their lives for the entrainment of others and questions how desensitised we as spectators and commentators have become, and how apathetic we can be also, sitting back in the distance doing nothing as personalities destruct before our very eyes. Dan Hutton directs a subtle yet steady production and utilises Rosie Elnile‘s stylistic horizontal computer monitor set as a playground/cage for the protagonists to pick apart interactions. Baker and Romeo take on metophorical tennis matches via speech, Hutton directing mirrored conversation and interrogations by the protagonists presenting ideas on microphones. On two ocassuions, liquid pours down the edge of the ‘screen’ at a sustained pace, artistically portraying loss; moments like these contribute a silent melodrama showing Hutton’s sense of not deviating hugely from the pace already established. Hutton consciously has the audience thinking for themselves; this is most prevalent when Kieran Lucas‘ obscure sound collages depict a multiple of scenarios following the beginning’s of a vlogging star’s destruction-leaving the imagination to map it’s own conclusion and giving the evening a sinister edge.